One of the most common issues in America is being overweight. In fact, nearly 70% of all adults are considered overweight, and 35% of those individuals are considered obese. This is literally a growing problem, and has led to increased rates of both diabetes and heart disease. On top of this, a sleep study in Garland has actually shown that obesity can also cause people to develop a sleep disorder called sleep apnea. To further complicate things, sleep apnea can also lead to excessive weight gain, creating a very destructive cycle. March is actually Sleep Apnea Awareness Month, and in that spirit, Dr. Keane Fedosky is going to discuss how obesity and sleep apnea are related to one another, and how this can affect you. For many people, having sleep apnea and being obese can be a “chicken or the egg” type of situation, because both conditions can lead to one another. One way this manifests is how a lack of sleep can influence your appetite. When you feel hungry and how much it takes to make you feel full are based on signals your brain gets from hormones. This is why you don’t simply forget to eat and know exactly when to stop. However, if you are losing sleep on a consistent basis because of sleep apnea, it can easily throw off the balance of these hormones. This can make it harder for you to feel full and cause you to be hungry more often. It can be very difficult for a person to manage their diet when their body is acting like it is starving, and this is why the two conditions are often seen together. One of the causes of sleep apnea is having a large or thick neck, which is very common for obese people. The excess tissue on the throat puts pressure on the airway, which not only can cause snoring in Garland, but can also make it much easier for someone’s throat to become blocked throughout the night. As a person continues to put on weight, this situation becomes even more severe, and their sleep apnea will probably get worse. 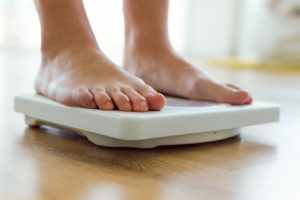 As a person becomes more obese, it can be difficult for them to maintain a healthy activity level, which in turn causes them to put on even more weight, which can eventually lead to sleep apnea due to the reason we previously mentioned. On the other side of the equation, a person who is constantly sleep deprived will probably have a lot of difficulty finding the energy to exercise, making them much more susceptible to putting on weight. The two conditions exacerbate each other, making it much more difficult for a person to both lose weight and sleep properly, which can dramatically put their health at risk. If you are suffering from sleep apnea and obesity, there are a few steps you can take to help yourself. Firstly, you need to get your sleep apnea treated immediately. To do this, simply contact our office, and we will guide you throughout the entire process of getting your sleep apnea diagnosed and treated. You will be able to address this problem much faster than your weight, and it will make it much simpler for you to lose weight as well. Once you are getting a full night’s sleep on a regular basis, it will probably be much easier for you to exercise and maintain a healthy diet, which will help reduce your sleep apnea symptoms. If you have any more questions about how sleep apnea and obesity are related, or how you can start getting the restful sleep that you need, please give us a call today.